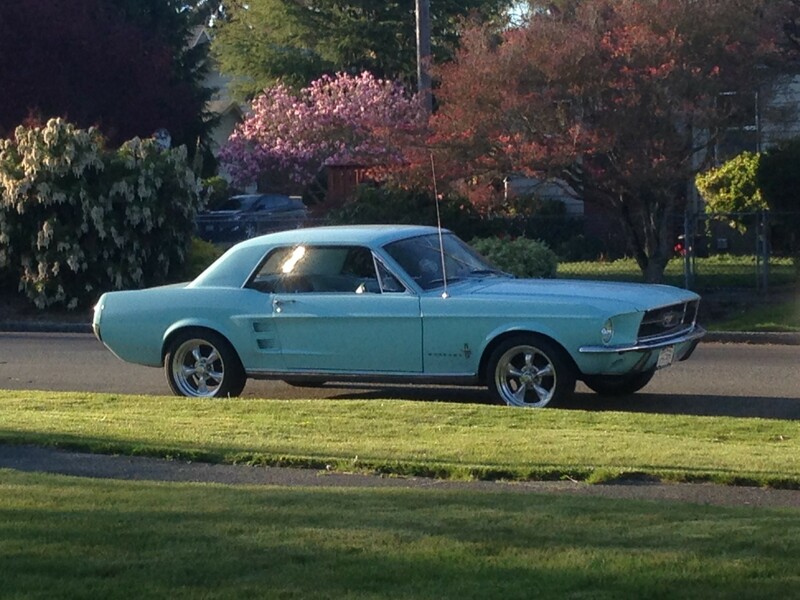 Ever since I can remember, I have been a huge fan of classic cars; particularly classic Mustangs. When I was a teenager I saved up enough money and I began looking to purchase my first car. I knew what I wanted. 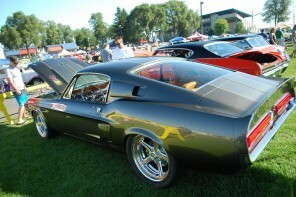 A 1967 Mustang; either a coupe or a fastback. I looked at a few before my dad came across this picture in the Wheel Deals magazine in November 2000. I was 17 years old. It didn’t look like much, but my dad showed me the picture and said he would stop by and take a look. I remember talking to him right after high school basketball practice, and he told me the car was in VERY good shape, and was a great deal. I told him if he thought it was good, go ahead and get it (with my cash). He did! It cost me $2400. I remember being so excited for the next few days, although I could barely contain myself because I wouldn’t have the opportunity to go out and see it until the next weekend when we were to pick it up. As I pulled up to the car for the first time, I was overwhelmed with joy! It was so much better than the picture showed! 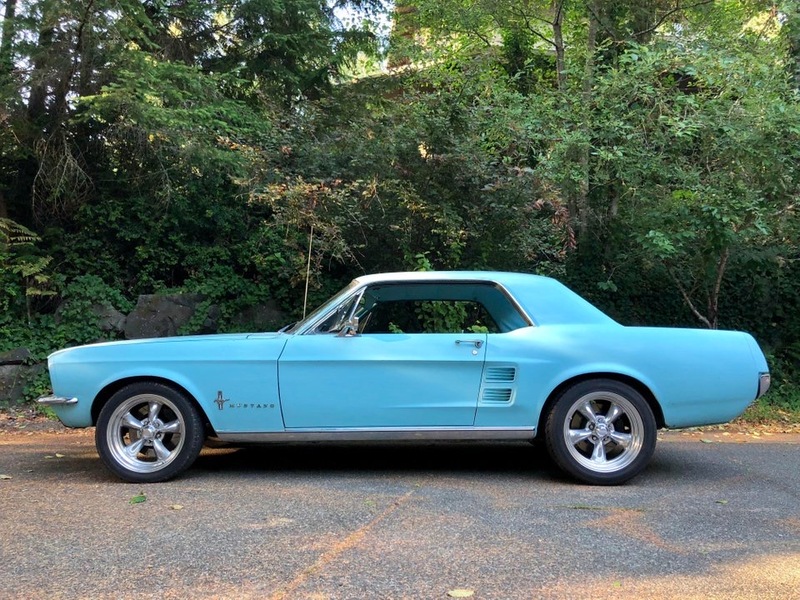 The color on the 67 mustang was a very light blue, called frost turquoise (I would later find that this color was only offered in 1967). The story on the car is this: It had been sitting in a garage since 1984 – started only a few times since then. The guy who we bought it from had stored it after his mother died. It had been hers – she was a grandma! She bought the car from the original owner – a lady from the Seattle area. The car had 73K original miles on the matching numbers engine with everything original; even down to the FoMoCo black wiper fluid bag! 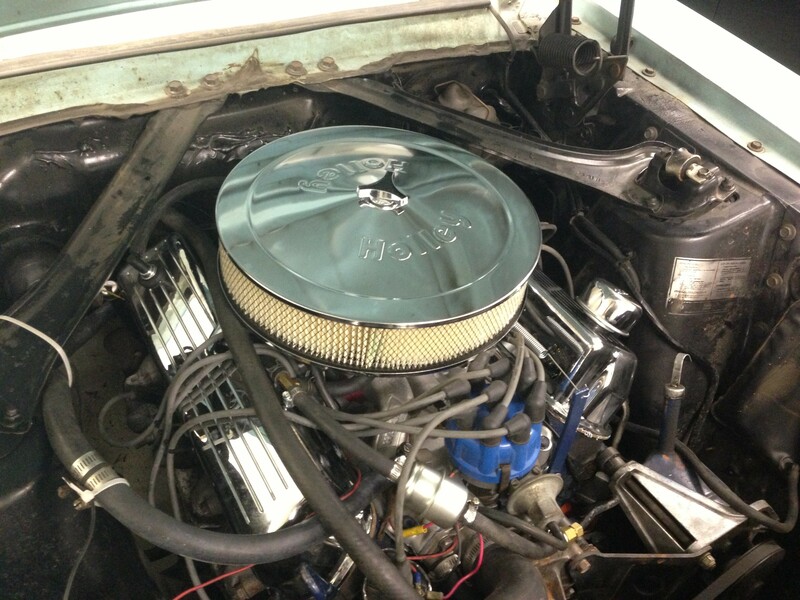 The Mustang had the original 289 V8 4.6 Liter with the 2 barrel carb. It was pretty much stock except for duel glass packs were put on the factory duel exhaust. The rumble from those packs really sounds great! Since this picture in 2002, I put on a new set of wheels and tires, along with a complete rebuild of the engine, front spension, and brakes. Here is what it looks like today. This car has been such a fun project for me! Working on it was almost as much fun as driving it all summer long. It used to be my dream car. Now it’s my car. Update! Here’s the recent brake, exhaust, and steering upgrades! When you do please contact me. I am now 70 and a widow but would love to have this baby. Thank you for the offer, but this was my very first car, I bought it when I was 16, and I never plan on selling it. I’ve heard so many stories of people who wished they never would have sold their first car. I promised myself I would never sell my Mustang. Sorry Robin, not for sale. Please contact me. I would love to purchase this beauty from you. Thanks for the offer, but she’s not for sale. I had one that I bought at Englewood Ford, in Englewood, New Jersey in 1967. It cost me $2,460.00. The color was called Robin’s Egg Blue. I just noticed that I sent you a message a year ago about this car. Any idea where it is today. I, in 1967, bought a 1967 Mustang Coupe, 6 cylinder, Robin’s Egg Blue with black interior, from the Ford Dealer in Englewood, New Jersey. I paid $2,460.00 through payments of $70.00 per month. The original little insignia plates on the sides were blank, but my friend had a 289 and he raced his car. We traded, so I had the 289 insignia plates on the side of my car and he had the blanks. In 1970 my husband totaled my stang, 2 days after our first daughter was born. My husband passed away in 2012. 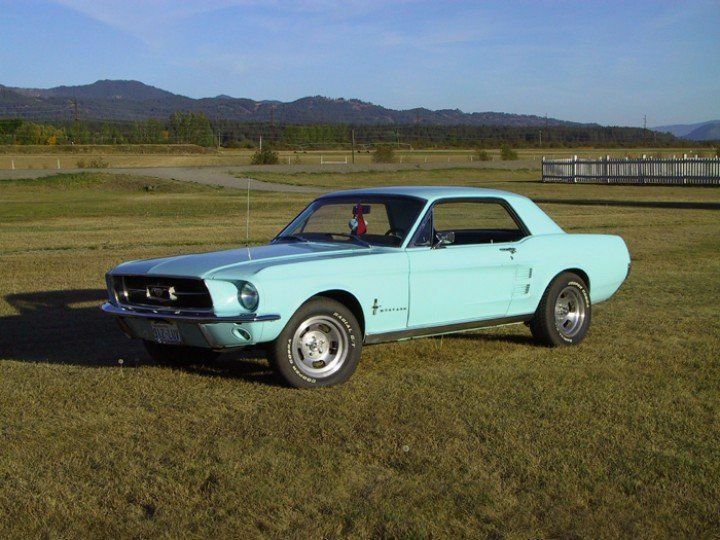 I am still looking for another 1967 mustang, 6 cylinder coupe. I can have it painted but I loved that car. I am 69 this coming March and would love to find another. Could you help. My name is Robin Hanlon, I live at 16 Sanfordville Road, Warwick, New York 10990. My email is [email protected]. If you know of any 1967, especially Robin’s Egg Blue with black interior please let me know. Thank You so much. So, how many miles on it, how much do you want. Since it use to be your dream car and now it is, How much and how many miles.? Everything is 4 years ago with you. I am not looking for a 289. Looking for stock 6 cylinder. 200 cubic. 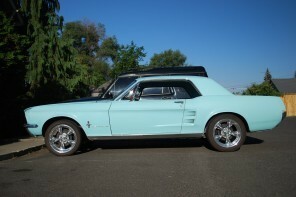 Robin’s Egg Blue, 1967 Mustang Coupe. Look it up. Bought It at Englewood Ford, Englewood, NJ in 1967. Paid $2,460.00 at $70.00 per month. maintenance tips, remove corrosives from its exterior from time to time. It will look more awesome! It’s summer time again here, so I took the Mustang for the first drive of the year! It’s definitely get to have it out on the road again! I already had one photo loaded, just added 3 more. Only one is showing up on search though. Or there are photos on my profile. Thanks Steve. 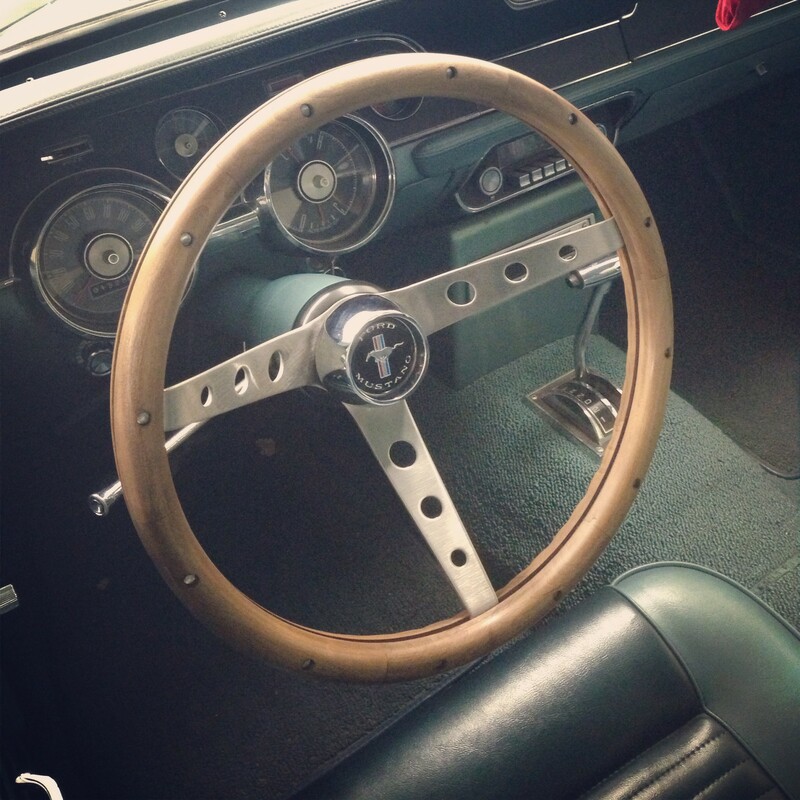 The interior is the original Aqua. Transmission is the original C4. I’d love to see some pics of your Mustang, too! Wow. You really did a great job on it. I love the color. I also like the chrome wheels. What color is the interior? Transmission?I love classic Mustangs too and also have a 1967. I really like the lines of the 67 and 68’s for some reason. Mine is a metallic burgundy color and fully restored but it has a 302 with a mild cam instead of the stock 289.
very nice car but I wish I had a 69 429 Boss Mustang TA it has been a dream car of mine since I was a teenager. Looks good. I have a ’67 too. It’s a convertable and I bought it just before I turned 16 way back in 1979.
and I love the color as well!!! Had it about 10 yrs ago never drove it was same color with a six in it sold it for more then i payed was at bens house it was a 68 patti yours was a 67 but i dont think itz called robin egg? 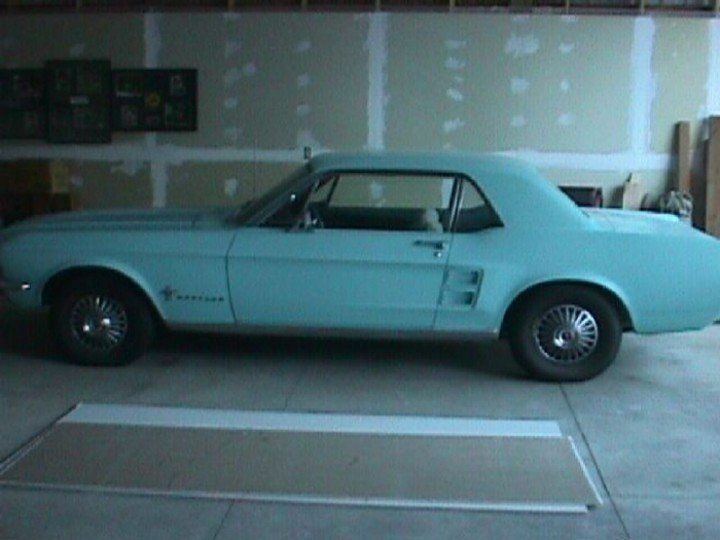 When did you have a robin egg blue 67 mustang? Yes it does. And I used to love driving it. I agree. I’ve been thinking about dropping the front an inch or two. Yeah – I ran those slotted mag wheels on the car for 10 years and just decided I wanted a change. Oh, and yes, the classic mags would have been my choice also, but the ones you’ve chosen look nice as well. Congrats, but don’t ever sell her. You will regret it sooner or later. Keep her going and keep her up. very nice find……..and enjoy it…they are not made like this anymore…. love the wheels nice ride would be rad loward a bit. 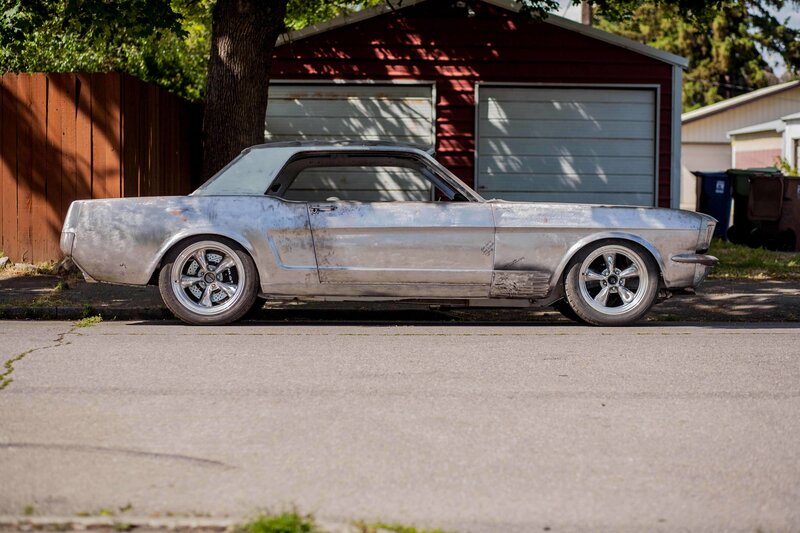 looks great , you did a great job.its your car do things the way you like and don’t let people tell you different.i have a 73 mustang fastback and it is custom/modified people say things they don’s like but I don’t care it’s mine.again great car! Looks a lot like my old ’68. I would have kept the first set of rims you had instead of changing out to a modern looking rim..IMO it looked better with the classic mag rims.